Bento for Kidlet: Sgt.Serge KungZhu Bento! So, I have made a ZhuZhu Pet bento before but in case you don't know about them, a ZhuZhu is an electronic hamster. They are super cute and have now come out with a more boy targeted set called KungZhu which features military and ninja hamsters. Kidlet and his friends have been dying for them and I was lucky enough to win a set from Sara The Savvy Shopper! This is Sgt.Serge the KungZhu pet! 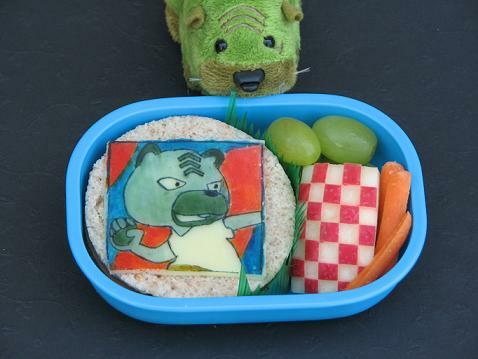 He looks a bit more formidable in bento form. His cute little hamster self is just difficult to be intimidated by because he makes a little cooing noise when you turn him on haha. Sgt Serge is made out of food color marker on cheese and sits on a soy ham sandwich. On the side are the usual suspects of grapes, carrots, and checkered apple. The best part of the KungZhu sets is that they attach to the other ZhuZhu pet sets! 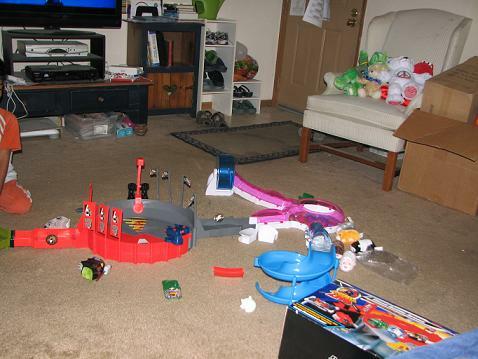 The pink ones at top are our ZhuZhus and the red and grey battle arena attached right to it! 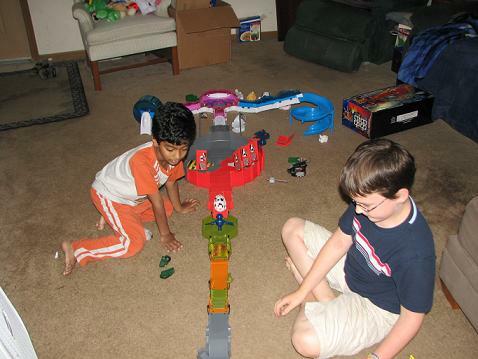 This has been endless amounts of fun for Kidlet and his friends. Of course I have to keep taking the baby ZhuZhu away because they like to put it in the battle arena and let it get pounded. *sigh* boys. Here's Kidlet and a neighbor buddy letting Moo the ZhuZhu go down the training field! Awesome! I just stopped by to see what amazing creations you have been up to and saw this...so glad you and Kidlet are enjoying the Kung Zhus! My kids had them out today and I thought of you and wondered how they went over! I've never heard of this toy, but I'm impressed as ever with your drawing skills. I love the checkered apple too. Adorable! Thanks for linking this up at Bento Blog Network!